Are you looking for a reliable and sturdy baby gate? Then you may want to check out the Regalo Extra WideSpan Walk Through Safety Gate. The Regalo Extra WideSpan Walk Through Safety Gate is made of metal, and has been imported. It can easily be set up with the pressure mounts, or you can use the included wall cups for added security. This product expands to fit openings between 29” to 58”. It stands 30" tall. The lever style handle with safety lock is easy to open, as it is an easy one touch release. It is easy to walk through. This is JPMA certified, and this works well for pets too. Along with the gate comes a instruction manual, one 6-inch extension kit, one 8-inch extension kit, one 12-inch extension kit, four pressure mounted spindle rods, and four wall cups. As of this writing there are 2,239 customer comments and 307 answered questions for the Regalo Extra WideSpan Walk Through Safety Gate. I've read through the customer feedback, and then condensed the results into this review. I hope that this helps you when shopping for a baby gate. This gate is a pressure mounted gate. The Regalo Extra WideSpan Walk Through Safety Gate is not going to be a safe choice for the top of stairs. You will want a hardware mounted gate for dangerous areas such as the top of the stairs. However, this is a great gate for keeping a child out of the kitchen or putting between any doorway that doesn't have a drop off. "BE SURE to ALWAYS push down the latch all the way to lock it. My son just learned how to open the gate if it is not fully latched and locked. Once locked he is not able to get it open! Five star gate!" "The gate is good quality and well made and the price is great." "It was actually easy to install. NO TOOLS REQUIRED after you switch the pressure nobs. Less than 10 minutes tops." 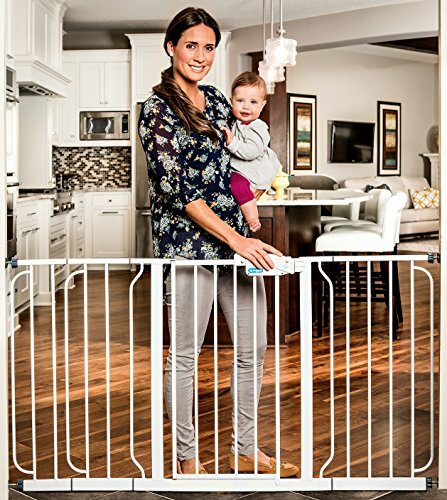 The Regalo Extra WideSpan Walk Through Safety Gate is a quality gate at a great price. It is a pressure mounted gate so that means that you won't have to drill into your walls to install it. It also means that this gate is not secure and safe enough to be trusted at the top of stairs. For top of the stairs gates, makes sure to buy a hardware mounted gate instead. Customer comments on ease of installation were very positive. If you buy this gate, make sure to be cognizant about latching it all the way down so that toddlers don't figure a way to open it.